Make sure everybody knows where and when the party will be with the Business Anniversary Flyer Template! A phone call will go on deaf ears. An e-mail certainly won’t suffice. But this striking, gorgeous flyer template absolutely can’t be ignored! Expertly designed by the FlyerHeroes team, once purchased, this flyer is fuller customizable so you can add in all the details of the Business Anniversary Party. Add in some social media connects to make sure everyone in the office knows! These anniversaries don’t come along very often, so make sure the party is memorable with the Business Anniversary Flyer Template! 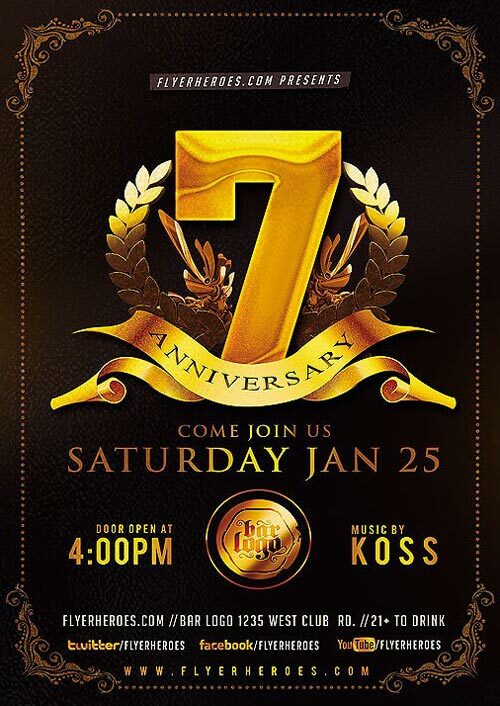 Anniversary Party Flyer Template from FlyerHeroes are fully editable Photoshop PSDs. Once you have downloaded this template, using Adobe Photoshop CS4+ you can make use of this flyer design an unlimited number of times 100% royalty free. You are free to customize this design however you wish and use in both personal and commercial projects without ever crediting FlyerHeroes. Where to download the stock photo? We recommend Depositphotos or Photodune for high-quality stock images! Flyerheroes.com is one of the highest quality collections of flyer templates available on the web. Stand out from the crowd and dominate your local nightlife marketing playing field with our jaw-dropping collection of Club Flyer Templates. Thousands of bars, nightclubs, music venues and brand-name events trust our club flyers to spread their message, every week!